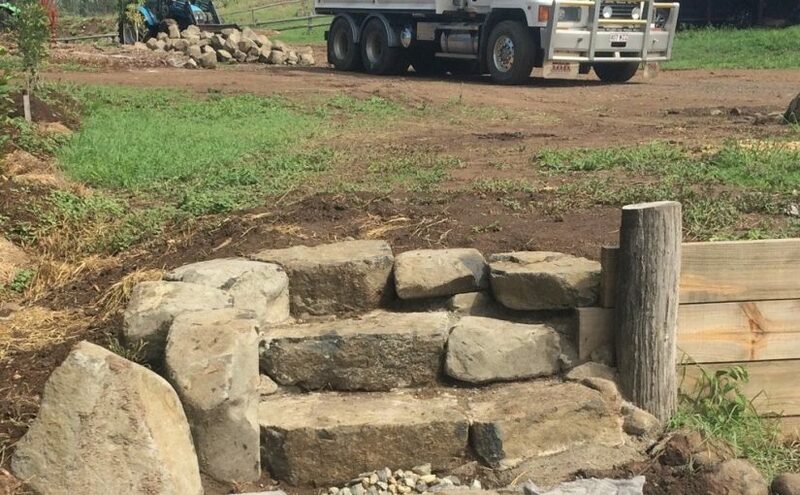 A million dollar weekender at Sunshine Coast has just had 32 truck-loads of Sunshine Basalt delivered for rock walls, and the landscape gardener loves them. A load of rocks to Victoria Point yesterday for stairs was pronounced perfect. The Sunshine Basalt Volvo is 27 years old, and has just clicked over one million kilometres. The 14 litre NT855 Cummins motor replaced out an old Volvo 16 litre engine . Says George, “ I like Cummins, I’ve grown up with Cummins. I’ve dealt with Torquepower since the early days 35 years ago, buying pumps and injectors for my mechanic in Gympie when I was running a T-line 230. I knew my truck should pull better than that, even with a 22 and a half tonne load of rocks.